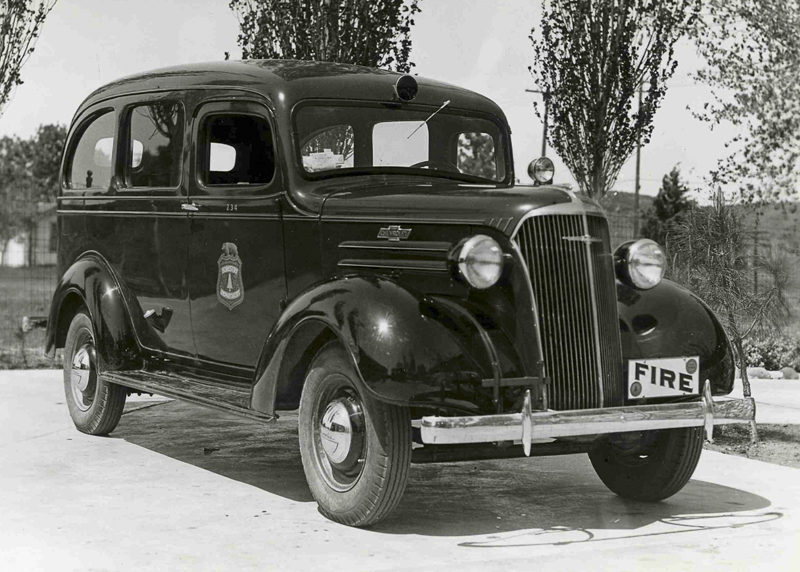 The Soledad Division Assistant Fire Warden's 1937 Chevrolet Carryall, parked at Soledad Division Headquarters in Newhall, where it's now known as Los Angeles County Fire Station 73, 24875 Railroad Ave. According to Fire Capt. Paul Peppard of Station 73 (in 2014), the position of Assistant Fire Warden for the L.A. County Forestry Department's Soledad Division (north county, based in Newhall) became the L.A. County Fire Department's Division 3 Assistant Chief. The Division 3 Assistant Chief was quartered at Fire Station 73 until Jan. 1, 2013, when the office was moved to the then-new Fire Station 150 on Golden Valley Road. Station 150 went into service Feb. 1, 2013, and held its public grand opening March 29, 2013. The Carryall was a model of the Chevrolet Surburban that was produced from 1935 to 1940. It had the frame of the half-ton models that were produced at the same time; the body style differed in that it had the basic shape of a woodie — but it was all-metal. It sat up to eight people: three in the front, two in the middle row and three in the back. The rear cargo area had an option of hinged doors or a tail/lift gate. FD3701: 19200 dpi jpeg from jpeg courtesy of Fire Capt. Paul Peppard, Station 73, Los Angeles County Fire Department, 2014.